The Daily Draw: 3/16/15—Wanting More. And More. And More. 3/16/15—Wanting More. And More. And More. I've been thinking "more" lately. Not that I'm spending additional time in thought, but I've been thinking about the concept of "more" more often lately. It's a human urge, to a degree. I imagine we all have it, though some may have tamed it. It's nothing new. As a species we have sought more land, more food, more security, more money, more youth, more love, more comfort and more stuff since we've become "civilized", pretty much. And by "more", I mean more than is necessary for survival and/or happiness. In cave man days, we probably specialized in having just enough. But over time, as we moved out of caves and into homes and villages, the "more" has crept over us. You don't see much of that in the animal kingdom, outside of humans. Squirrels store up nuts, but probably not more than they need. And there's nothing wrong with having more than you "need". But I think it's important to question whether or not our desires for more are really healthy. There are certain benefits to the need for more. Chief among them is progress. Most inventions rise from need. We wanted more in the way of communication and invented the telegraph. Then we needed more again and invented the telephone. Then we needed more again and invented Skype, for example. All of that came from our insatiable need for more and better. The same thing goes on an individual level. We expect more from ourselves and we find ourselves performing better and becoming more successful. The whole concept of self improvement and even spirituality is based on the desire for more...more self love, more inner peace, more communion with God. But, as with most things in life, there's a thin line between healthy "more" and unhealthy "more". Wanting more food or sweets to the point of obesity is unhealthy. Wanting more money to the point of neglecting your family is unhealthy. Wanting more house to the point of entering into debts you can't pay is unhealthy. Wanting more alcohol to the point where you pass out is unhealthy. If you look around you, there are plenty of visible expressions of the need for more. But what about the more subtle "mores" in our lives...more attention, more affirmation, more acceptance? Those can be unhealthy, too. "This will never end 'cause I want more. More. Give me more. Give me more." In the context of the show, they are talking about how the warring and pillaging and murdering will never end because they are driven by the need for more. It costs them the lives of people they care about. It costs them in terms of time with their family. It costs in terms of security and peace of mind. It costs them in many ways. But they want the power, land, gold...whatever...that comes with invading new lands and slaughtering people more than they want peace and family. Of course, they would tell you they are doing it FOR peace and FOR family. But they're doing it at the expense of all that. There never comes a day when they settle down and just enjoy all the things they tell themselves they're doing this for. As the song goes, "this will never end because I want more." On the backside of a quest for more is a feeling of lack or fear of lack. There are some occasions where I feel an "irrational need for more". This could be having an appetite for food when the belly is full. Or needing another pair of shoes when I have plenty or whatever. That's when the need is unhealthy. And the need will only be satisfied with understanding what's going on beneath it, what price you're paying for it and healing it. This past week I was faced with a question of "how much are you willing to pay to get X?" The price, in this case, was my sanity. And the "x" was money. In the past, I've paid that price many times for my job. But I see in the past year or two, that I'm not so willing to give up my own sense of peace and balance just to earn a buck anymore. Thank god my regular clients never ask me to pay that price, but from time to time as a consultant you get drop-ins who exact a heavy price on your energy and sanity in order to get the job done. So I've been thinking a lot about "more" and the cost of "more"...the cost of certain behaviors and the cost of certain presences in my life. As I'm getting older, I'm noticing that I'm no longer willing to pay the prices I once used to. And I'm also noticing that when I decide I'm not willing to pay the price, I'm not losing anything other than the weights of negativity that have been holding me back from bigger goals. I'm seeing the folly of "lack". All we really need is food, shelter and water. And love, maybe. I've got way more than my share of all of that. Any lack I feel is driven by something other than need...some insecurity or false sense of entitlement. Just as the song says, "this will never end because I want more," the need for more won't end until you stop wanting more. What I mean is that the day will never come that you'll be miraculously cured of your desire to drink too much, for example. You have to make it happen by making the want for more to stop...by not being willing to pay the price of the getting it...by not giving in. A good way to measure whether or not a need for more is healthy is to start being really honest with yourself. 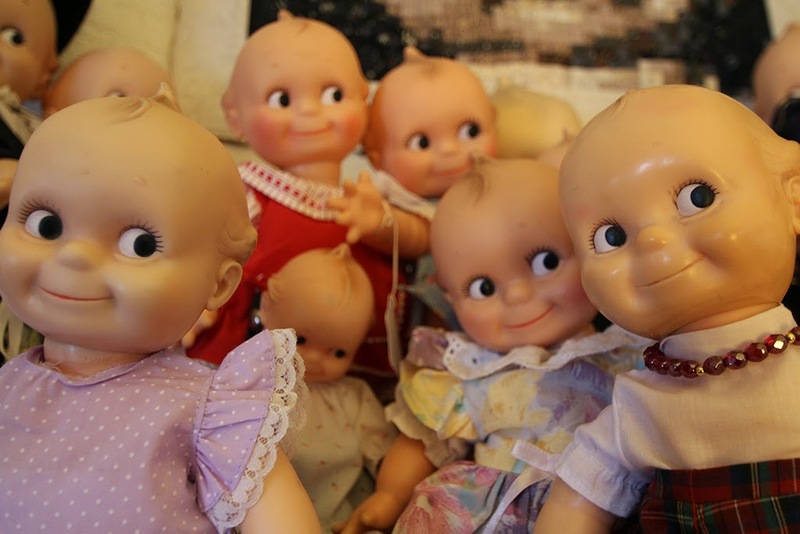 Does getting that "one more kewpie doll" make you feel fulfilled and happy? Or is that feeling only temporary, followed by anxiety anxiety and the further need for more? Is it really adding to your life or subtracting from it in terms of things like lying about buying kewpie dolls and spending more time shopping for kewpie dolls than doing things that feed your life in lasting and meaningful ways? You can't fix something you don't know is broken, so be honest with yourself, figure all the costs (and even healthy things have costs) and see if your desire is worth it. I recently got a message in a meditation about all of this and what came up was "there will always be enough." That's a comforting mantra to use when that urge for more comes along, especially since it's probably true. Most of the stuff we convince ourselves that we need is really just luxury...luxury to be enjoyed as such. But luxuries become mundane when you have them all the time and then you need more and more to feel the joy of luxury—until you can no longer feel the joy of it at all. I think the more we acknowledge and have gratitude for all we actually do have, the less we find ourselves wanting for more. Chances are, whatever you're struggling with is an irrational desire for more...a desire not driven by a long history of lack, but rather a fear of lack in the future or a lack of appreciation for what you have in the present. Figure all this out and you could have the keys to your own freedom and happiness. And that beats more kewpie dolls any day.